My guess is that there a more than a few people who used to classic ski and have either gravitated to skate skiing, skiing classic on pattern (fish-scale) skis or have stopped skiing, much because the mystery of kick waxing was a challenge they were unwilling to continue to wrestle with. If any of these scenarios describe you, it may be time to come back to classic skiing on what we are calling “skin skis”. I cannot resist a little history here. In pre-industrial cultures of the arctic regions people needed to hunt to survive. This meant winter travel over snow and ice. These people used natural materials to construct tools for travel and developed skis made of wood. They also developed strips of tanned seal skin to attach to the bottom of the skis as the hairs on the skin laid down in one direction allowing the skis to slide forward but not backward. The skins were from real seals, a prey animal for the people. As cross country skiing became a recreational pastime and not a survival skill, skis became lighter and waxes were developed that could mimic the grip of the seal skin. The wax allowed for much more efficient gliding while still (at times) adequate grip or “kick” for moving forward along a groomed track. But snow is a complex medium and the myriad types of snow crystals made kick waxing a challenge. Waxes that gripped well in cold snow would not grip at all as the snow warmed or transformed. Soft waxes that gripped in warmer snow would develop ice on the wax in colder snow. To be a cross country skier meant embracing and practicing the “art/science” of wax selection and application. Just last week I went out on wax that I thought would work well only to find that I had marginal kick on gentle hills and nowhere near enough for steeper hills. After trying two other waxes and taking about 20 minutes of time I found one that was better than a “poke in the eye”, but not much. In the late 1970s and early 1980s ski companies returned to the idea of applying skin material to the kick zone of skis. (Remember, skate skiing had not yet been invented as a cross country ski technique.) The idea was good, but the materials were not up to the stresses of the friction created by the skins. The skis, primarily made of wood, or early fiberglass models, would not support the skin off the snow so that it would glide like wax. If the skis were stiff enough to glide they were often too hard to kick. It was about this time that some companies developed pattern bases that used a fish-scale like kick zone. These worked pretty well and replaced the skin as “waxless” skis. The kick was reliable and the skis needed little care; put them on and go skiing. But they tended to be much slower on the glide than wax and noisy when running down the track. You have probably heard the buzzing of fish-scale skis as folks stride along in the classic track. During this time skiers who enjoyed alpine touring or Randonnée skiing played around with different materials for climbing skins and found that mohair, a natural material from the hair of angora goats, worked very well. It was fast, light and made from a renewable resource. It looked like seal skin and the name has carried on. No seals need be killed for skiing sport. Modern ski materials now enable companies to make skis that can support the reintroduction of skins on the base for grip in classical technique. About 6 years ago Atomic introduced the Skintech classic skis with nylon skin material treated with teflon to enhance glide and inhibit icing. They were a bit heavy and still not as fast as wax, but when properly sized were faster and quieter than pattern skis. We could see that there was potential in the idea. About 4 years ago Madshus introduced the Terrasonic Intelligrip skin skis. Madshus skis have foam cores and the cores could be made with a higher resting camber, but not added weight. This improved the overall performance of their skin skis, but there was still a glide liability. They were pretty good on down hills if the skier moved their weight back. And they were pretty good while double poling, but in diagonal stride it was a bit like driving with the parking brake on. They would move, but the glide was “draggy”. Over time, with appropriate R and D, companies now produce skin skis that are coming close to good waxables without the challenge of waxing. The good skis are not cheap, but there are many performance oriented skiers who are happy to invest in equipment that gets them back to classic skiing. Real mohair treated with teflon is used on the high performance models. It is not as durable as the skin material made of nylon/mohair mixes, but is is also replaceable if it wears out. The cheaper nylon mix is on the lower priced skis and is more durable, just not as fast. Fischer is making a Carbon Skin ski with two off set narrow teflon treated skin inserts. There is less surface area at the front and rear of the kick zone with more surface contact under foot. They use the higher resting camber of the Carbonlite 902 which enhances the glide. We will soon see Fischer Speedmax skins with a longer 90L camber, more demanding of good technique but faster on the glide. Madshus has added the skin base to their Redline models. The soft tip and tail and elastic camber of this model makes them feel a lot like a waxable, especially with a move-able binding. (A bit more on bindings in a minute.) Salomon has taken their world cup classic ski construction and added a Pomoca skin insert. This is (so I am told by those who do AT racing) the fastest skin material. They are calling it the S/Race model even though it has the S-Lab construction. In most conditions this is the fastest of the skin skis I have tried. Selecting the right skin ski is important. While for some touring skis it is ok to go to a big-box sporting goods store and simply pick a pair off the wall, for skin skis it is a good idea to go to a specialty shop that has experience measuring and selecting waxable and skin classical skis. Ask if the sales person uses these models. In general experienced skiers, former or future races, will want a stiffer ski that requires good technique to engage the skin kick zone. People who are more inclined to go out for pleasant recreational skiing and don’t have precise technique or the desire to maximize glide on every stride can get away with softer and less expensive skis. All these skis respond to moving the binding on the ski. Fischer, Rossignol and Madshus all come with plate bindings that allow the binding to be adjusted for more or less kick. By moving the binding forward on the plate it is easier to engage the kick zone. It also decreases the glide a bit. By moving the binding back on the plate it frees up the pressure on the front of the kick zone and enhances the glide. It does require more attention the the proper application of technique. We have found that at times the hairs of the skin will let go at the end of the stride if the binding is too far back or the ski is too stiff. The skin skis need a little more “care and feeding” than the crown or pattern skis. The hairs on the skins can pick up dirt. This could be from tree pitch, wind blown moss, hydraulic fluid from the groomer or klister wax from those old-school waxers. The skin insert should be cleaned periodically. Be careful here and avoid using wax cleaner solvents. These are strong enough to weaken the glue that holds the skin in place. There are many products available for cleaning skins and these are recommended. Swix makes a good skin cleaner as does Vauhti and Start. Fischer has partnered with Vauhti to make a skin care kit that includes the cleaner, fiberlene paper and an anti-icing liquid to apply after cleaning. The glide zones, as always, should be waxed regularly. 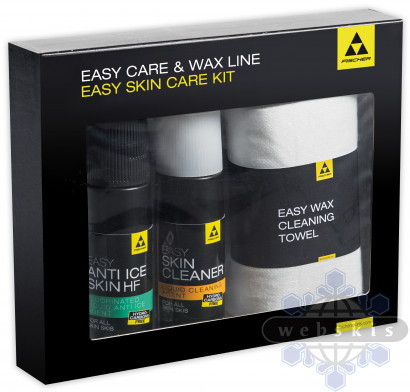 If using a standard iron applied wax, cover the skin zone with wide masking tape before waxing the glide zones. After scraping and brushing the glide zone remove the tape and treat the skin with anti-icing liquid. Now I like wax and accept the challenge of waxing. But I was out on my Salomon S/Race skis recently and had a nearly perfect session of classic skiing. In some places the track was fine for a warm blue wax, but other places it was glazed with warmer transformed snow. The skis had A+ kick everywhere, even on the refrozen parts of the track. Even World Cup skiers like Heidi Weng go out on skins (Heidi is on the Madshus Redline) for training in variable conditions. The skis are not happy outside the track or with lots of new snow, but they can be the solution when time is short, waxing is tricky and classic skiing is what you want to do.